The location of Springfield near the center of North America gives it a typical continental climate with warm summers and fairly cold winters. The surrounding country is nearly level. There are no large hills in the vicinity, but rolling terrain is found near the Sangamon River and Spring Creek. Monthly temperatures range from the upper 20s for January to the upper 70s for July. Considerable variation may take place within the seasons. Temperatures of 70 degrees or higher may occur in winter and temperatures near 50 degrees are sometimes recorded during the summer months. 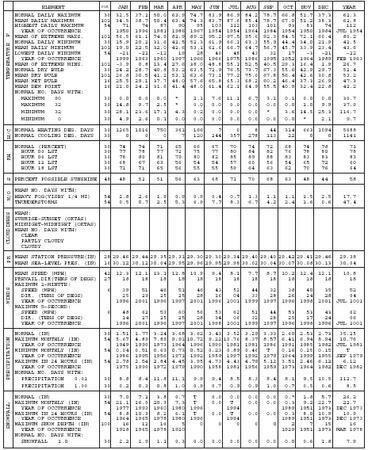 There are no wet and dry seasons. 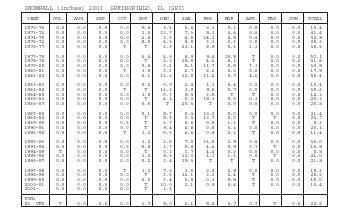 Monthly precipitation ranges from a little over 4 inches in May and June to about 2 inches in January. 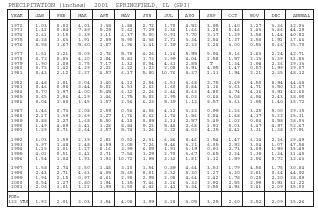 There is some variation in rainfall totals from year to year. Thunderstorms are common during hot weather, and these are sometimes locally severe with brief but heavy showers. The average year has about fifty thunderstorms of which two–thirds occur during the months of May through August. Damaging hail accompanies only a few of the thunderstorms and the areas affected are usually small. Sunshine is particularly abundant during the summer months when days are long and not very cloudy. January is the cloudiest month, with only about a third as much sunshine as July or August. 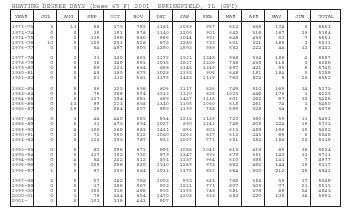 March is the windiest month, and August the month with the least wind. Velocities of more than 40 mph are not unusual for brief periods in most months of the year. The prevailing wind direction is southerly during most of the year with northwesterly winds during the late fall and early spring months. 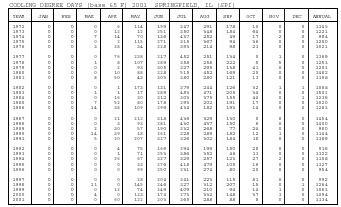 An overall description of the climate of Springfield would be one indicating pleasant conditions with sharp seasonal changes, but no extended periods of severely cold weather. Summer weather is often uncomfortably warm and humid. 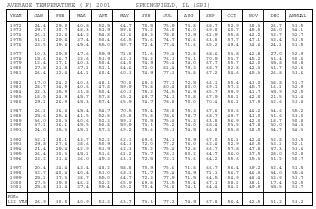 Based on the 1951–1980 period, the average first occurrence of 32 degrees Fahrenheit in the fall is October 19 and the average last occurrence in the spring is April 17.